This website is for the customers who shop in our brick and mortar store in Terre Haute, IN. We are constantly adding new products and have many additional unique items that are not listed on this website. If you have never visited our shop or haven't visited in a while, come in and browse, you will find it's worth the trip. and through ritual is sometimes used in symbolic representations of creation and fertility. The chalice is sometimes also used in ritual offering and other such aspects of ceremonial magic. Herbs and Heirlooms has in stock everyday a large selection of chalices in a variety of sizes and styles. This is a small sampling of the chalices available everyday at Herbs and Heirlooms. We attempt to keep all items on this website in stock, but an item shown may be out of stock from time to time. Thors Hammer all metal chalice has a small 1 3/4" silver plated chalice end mounted on a brass tone Thors Hammer. It is meant to be hand held until beverage is consummed as it may rock on its curved base. This heavy mjolnir is 4 3/4" tall. Appearing almost as though a traditional, wooden cup had been transformed to silver, this goblet features the mystical symbol of a pentagram on both its front and back. 5 3/4" x 3"
This simple, yet elegant, silver plated chalice has a double-ringed pentagram engraved on opposing sides. 6" x 2 1/2" tapered to 3 1/4"
Silver toned, with chalice centered in bottom of the chalice cup. A silver chalice with the Tree of Life carved on the cup. 3 1/4" x 1 3/4"
Displaying the three faces and phases of the Goddess, the Maiden, Mother and Crone, this chalice is a powerful display of Celtic and pagan symbolism. 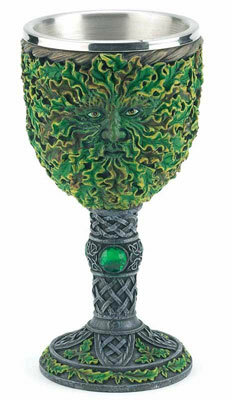 7 1/2" x 3 1/2"
Displaying the leafy visage of the Green Man, this chalice has been sculpted from cold cast resin to created an impressively detailed vessel for the altar. 7 1/2" x 3 1/2"
This cold Cast Resin chalice, wine goblet is a hand painted detailed design of the Norse Mythology "Thor". The inside stainless cup conveniently removes from the goblet, for cleansing purposes. Approx Dims: 3 3/4" x 3 3/4" x 6 3/4".